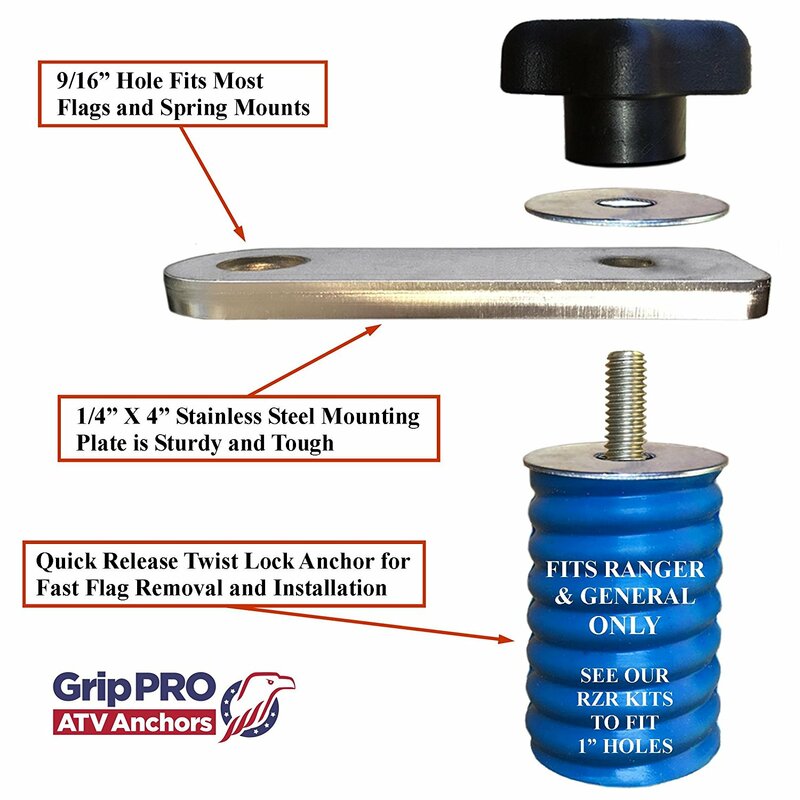 MOUNT YOUR FLAG - Quick release flag mounting kit for your Polaris RANGER or GENERAL by GripPRO ATV Anchors. NO TOOLS NEEDED - Super tight grip is achieved with our Best-Selling tie down anchor. FAST & EASY - Have your flag on or off in seconds. DOES NOT FIT RZR -see our RZR kits. VERSATILE - Mount in any of the rear platform / bed holes. DURABLE - Made of Stainless Steel components in the USA! LIFETIME WARRANTY. PLEASE NOTE: This Mounting Kit is for the Polaris RANGER / GENERAL and DOES NOT FIT the RZR. See our RZR Kit. 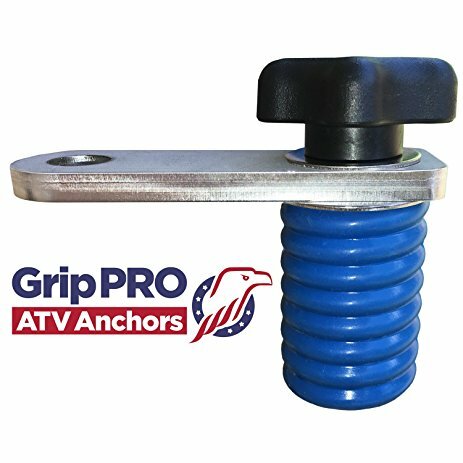 GripPRO ATV Anchors brings you a quick release Flag Mount Kit that allows easy and super-fast flag pole installation or removal without tools. 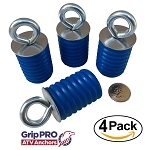 Comes with our best-selling knob tie down anchor to secure it anywhere in the bed or cargo rack you desire. Made of durable and strong stainless steel, it will last for years and comes with a Lifetime Unconditional Guarantee against any type of failure. Drop in, twist, lock & ride! 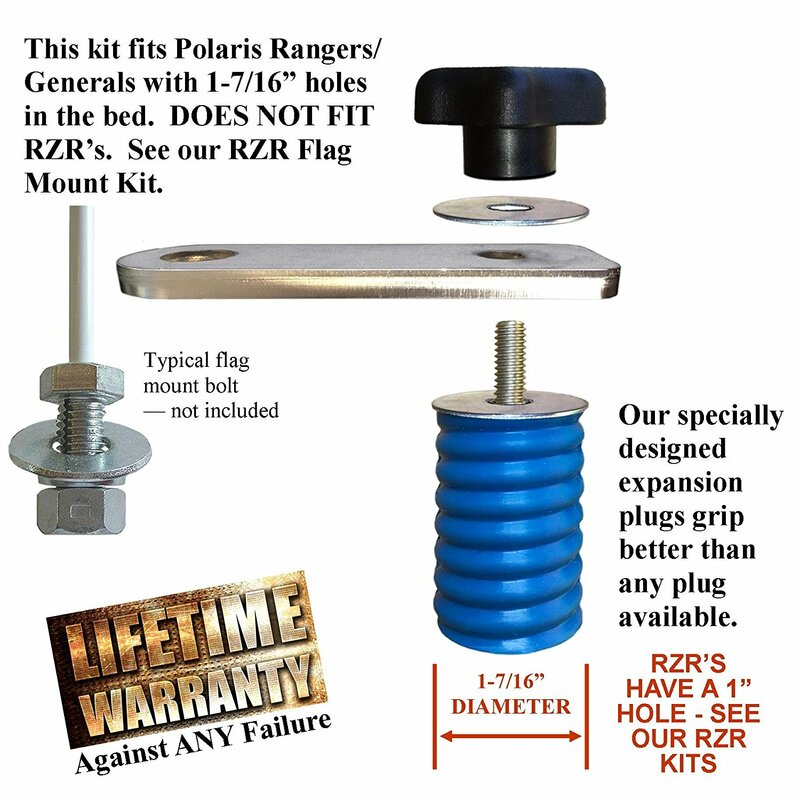 NOTE: ONLY fits Ranger & General - See our RZR kits for RZR Flag Mount Kits. Works with standard flags and LED and other lighted whip flag poles. Engineered with plenty of room between the anchor and the flag mounting hole for clearance of your bed or box. 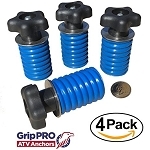 Fits Gorilla, Firestick, Atlantis and most other flag bases and spring mounts. Base / bracket is 1/4" Stainless Steel and measures 4" x 1-1/4" with a 5/16" hole for the mounting anchor and a 9/16" hole to accommodate most flags. Compare to Modquad, Hornet and Tusk mounts that cost more and are made of softer aluminum and may still require a mounting base. Made in the USA and comes with all hardware needed EXCEPT FLAG. If this flag mount kit ever fails, we'll replace it. This is a great product! It worked great with my whips. The company is also great to deal with. I needed a couple more shipped within a few days for my trip and they were very accommodating. Thank you for the great product and great service!